The "X" Continuity Man-to-Man Offense is designed for player specialization. Diagram X1 Shows the starting positions of the offense. (2) Ball dribbled away from you - jab step to basket and come off wing's screen to free throw line area. shows the start of the offense. 1 will dribble to the free throw line extended. 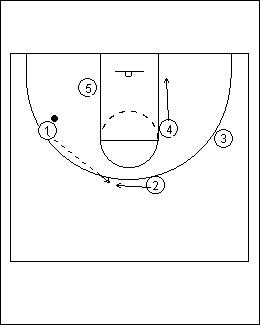 5 jab steps and comes high off 2's screen. 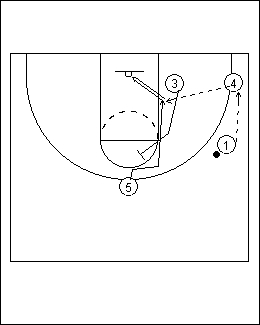 FIRST OPTION: 1 passes to 3 on his cut through the lane. 1 passes to 5 - SECOND OPTION is jump shot or drive to the basket by 5. 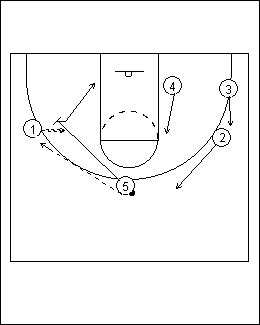 On 1's pass to 5, 2 will pop out to the wing area and 3 will step out and set a back screen on 4. 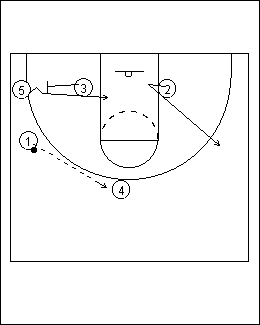 4 will cut off 3's screen to the basket. 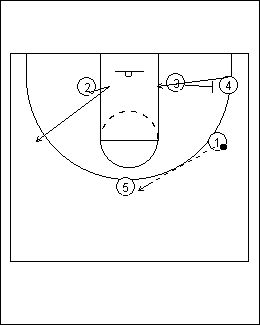 THIRD OPTION: 5 passes to 4 cutting to the basket for the shot. 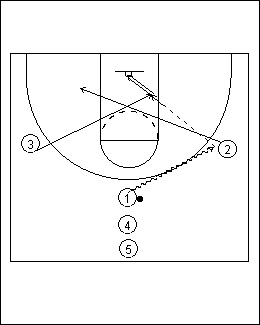 5 passes to 2 - FOURTH OPTION: 2 shooting a jump shot at the wing. 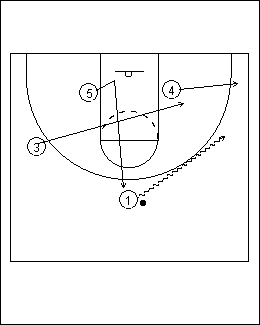 5 will follow his pass and execute a pick and roll with 2 - FIFTH OPTION. As 5 moves to set the pick and roll the other players adjust their positioning. 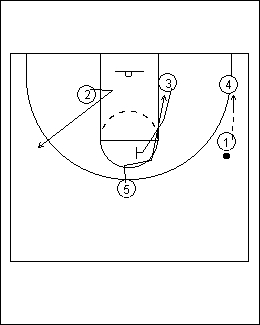 4 moves up the lane so that if his man helps on the pick and roll he may be open for the pass and shot. 1 starts moving back toward the middle of the court. 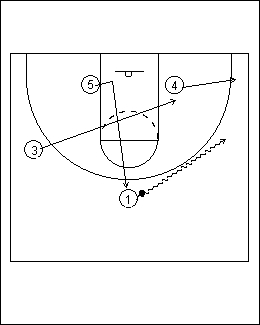 3 starts moving from the baseline to the wing position. If 2 does not have the shot or the pass to 5 rolling to the basket 2 will pass to 1 moving to the center of the court. 4 slides back down to the block area. 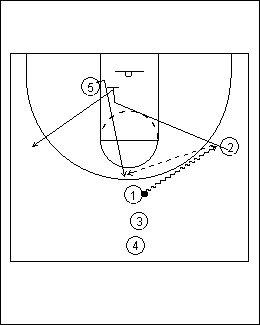 NOTE: 1 can now continue the offense by dribbling to either wing area. If 3 is you weakest player then you will always want 1 to dribble away from him. If 2 and 3 are both offensive threats then you give 1 the option of dribbling to either wing. 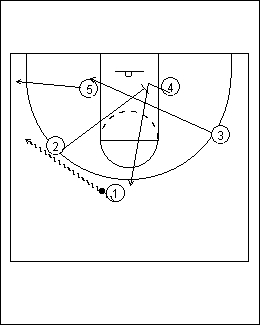 Diagrams X6, X7, X8 and X9shows the offense executed on the other side of the court in the same manner. The 'Corner Option' starts the same as the regular offense. But now 1 passes to 4 who has popped out to the ballside corner. 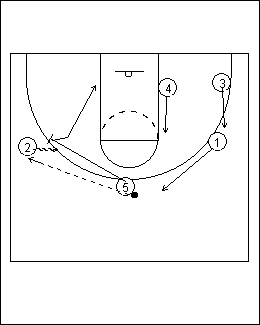 3 immediately turns and sets a back screen for 5. 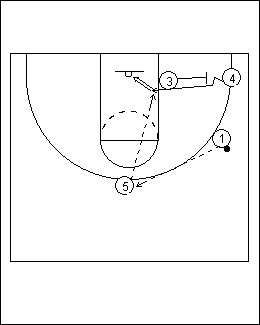 5 cuts off 3's screen to the basket looking for a pass from 4. NOTE: 3's rule is - if he is the "First Option" and does not receive the ball he will set a screen on the post player that does not receive the pass. As 1 comes down the court he holds up a 'Fist', this tells the wings that he is going to pass to one of them. They must get open to receive the pass. 1 passes to 2, and now assumes the role of a wing player. 1 and 3 cross - with 1 going first. 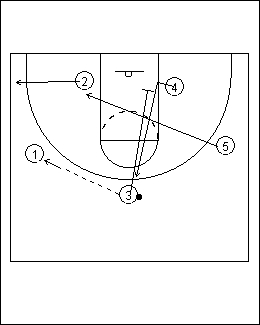 4 pops out baseline ballside. 1 screens for 5, 5 moves off 1's screen to the free throw line area. 1 pops out to the offside wing. Everything is the same except 1 and 2 have traded places. 2 must now play the point. In "X" FLOW all players play every position. 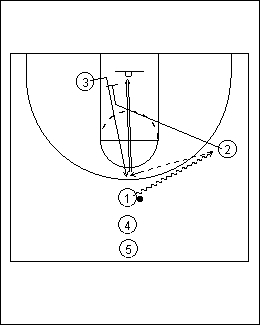 The offense will start as in the 'Fist Option' with 1 passing to 2, crossing with 3 and setting a screen for 5. 4 pops out baseline ballside. 5 moves off 1's screen to the free throw line area. 2 passes to 5. 1 pops out to the wing. 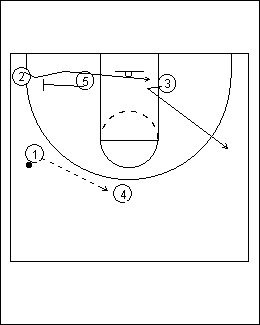 3 sets a back screen on 4. 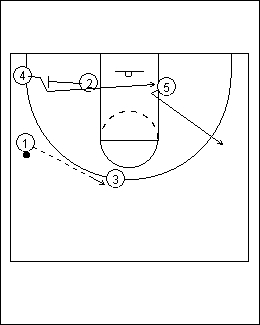 In "X" FLOW 4 will cut off 3's screen and move across the lane to the opposite block. Now 5 can run the offense in either direction. Diagrams X18 and X19 Shows 5 swinging the ball to the opposite side of the floor. And the offense is executed the same. 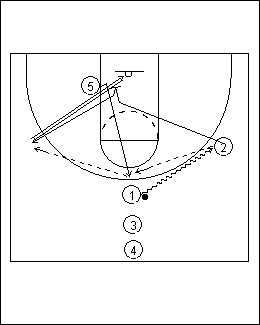 Diagrams X20 and X21 Shows 3 returning the ball to the same side of the floor and continueing the offense. 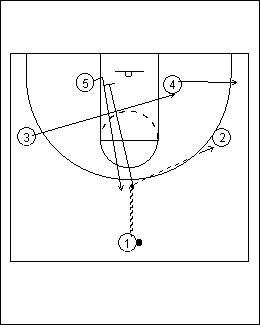 All drills will be shown to the right side but should be executed on both sides of the court. PROGRESSION: start with no defense, then add a defender to a certain offensive player and finally have a defender guarding every offensive player in the drill. The players line up as in the diagram. 1 at the point. 2 and 3 at the wings. 1 will dribble to the right wing. 2 and 3 will cross - with 2 going first. 1 will pass to 3 immediately after 3 crosses with 2 for a shot by 3. The players line up as in the diagram. 1 at the point. 2 at the right wing. 3 at the offside post. 1 will dribble to the right wing. 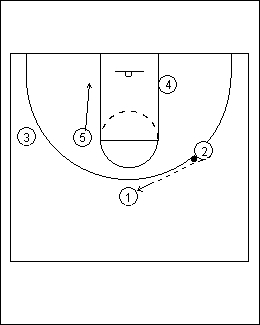 2 will cut through the lane and set a screen for 3. 3 will move off 3's screen to the free throw line area. 1 will pass to 3 for the jump shot. The players will line up as in the diagram. 1 at the point. 4 in the right post. 5 in the left post. 3 at the left wing. 1 will dribble to the right wing. 4 will pop to the baseline ballside. 3 will make his cross move. 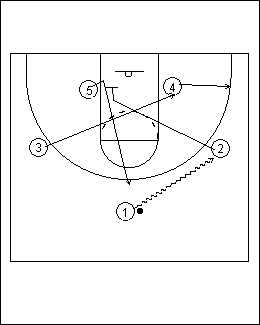 5 will move off the imaginary screen to the free throw line area. 1 will pass to 5. 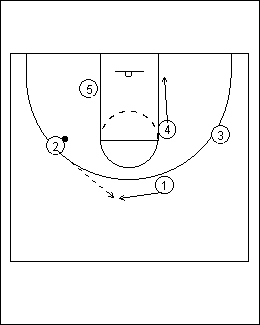 3 will set a back screen for 4. 4 will move off 3's screen to the basket and receive a pass from 5 for a shot. The players will line up as in the diagram. 1 at the point. 2 at the right wing. 5 at the left post. 1 will dribble to the right wing. 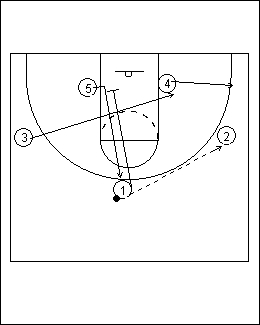 2 will cut through the lane and set a screen for 5. 5 will move off 2's screen to the free throw line area. 1 will pass to 5. 2 will pop out to the wing. 5 will pass to 2 for the jump shot. 1 will dribble to the right wing. 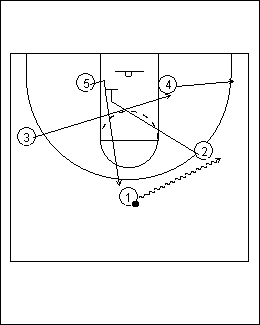 2 will cut through the lane and set a screen for 5. 5 will move off 2's screen to the free throw line area. 1 will pass to 5. 2 will pop out to the wing. 5 will pass to 2 and follow his pass and execute a pick and roll with 2. 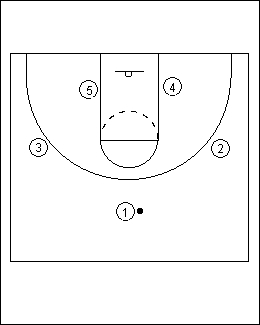 2 may shoot coming off the screen or pass to 5 rolling to the basket. The players will line up as in the diagram. 1 at the point. 4 in the right post. 5 in the left post. 3 at the left wing. 1 will dribble to the right wing. 4 pops out baseline ballside. 3 makes his cross cut to the right low block area. 5 moves off the imaginary screen to the free throw line area. 1 passes to 4. 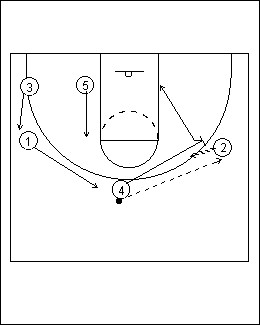 3 immediately changes directions and sets a back screen for 5. 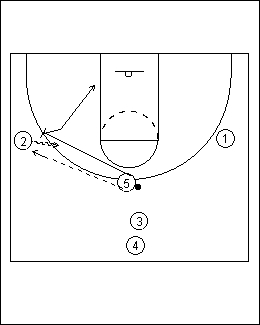 5 moves off 3's screen to the basket and receives a pass from 4 for a shot.